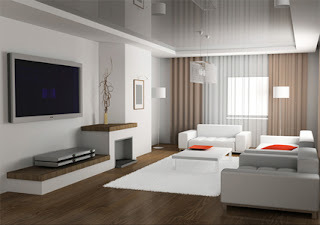 The minimalist living rooms follow the general lines of this style, simplicity, modernity, sobriety and elegance. The main idea is to have well-organized spaces, spacious and tidy. As for the furniture, this style seeks to use only the essential, therefore tend to place the sofa and chairs, or chairs and just to even just chairs, coffee table, even though some prefer not to use this last piece of furniture, really depends on the taste and preference of each one, but what is a fact is that the design of these should be on line, remember that another characteristic of the style, is the design in straight lines. As for shelves, it seeks to avoid the crush, therefore shelves or cupboards should have simple line of furniture design. Another decorating option is to place a TV or stereo, both devices should also have straight lines in its design, so flat panel displays are ideal. As for color, prevail game black and white, although other combinations are possible, remember that what is sought is no exaggeration of contrasts and creating environments sober, quiet and relaxing, but above all, functional and comfortable.